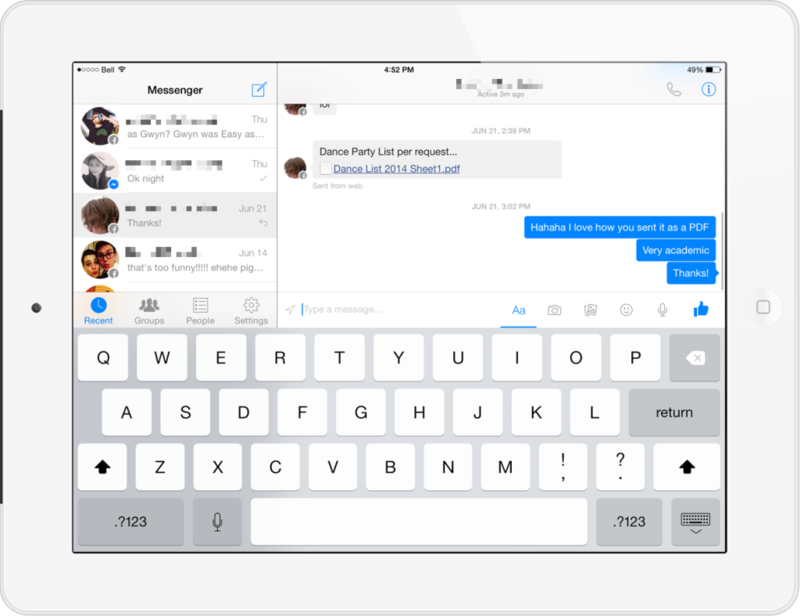 I don’t use Facebook Messenger often, but I think it’s great that it was released for iPad. Facebook seems like one of the de facto messaging services for a lot of my friends at work and from university, and bringing the Messenger app to the iPad does show some forward thinking on Facebook’s part. Just as with Google and Hangouts, Facebook is treating the iPad as a primary platform, and allowing users to begin a chat on the desktop, and then continue it from basically any device they choose. I’m also impressed with the app’s UI in general. It’s your standard two-panel affair, but it does have some fun along the bottom bar for messaging. There’s a clever photo picker, easy voice messaging, and large tappable stickers to play with. The UI sounds are also really on point. Just about the only thing I don’t like is the strange naming convention for updates. Facebook Messenger is supposedly at v8.0, but the latest update notes show a simple text display change, alongside general bug fixes and improvements. I’m guessing this is just a weird joke from the Facebook developers mocking the way that the industry does versioning on the whole, but as a user, it’s plain confusing. I’ve said this before, but I’d really like to see more of the popular messaging apps make the leap from iPhone-only to becoming real cross-device services. After all, with the announcement of iOS 8 and mainline features like Continuity, even Apple is pushing for a consistent experience across devices. Facebook made the switch, and I’m hoping other services like LINE Messenger are paying attention. Why Don’t We Have WhatsApp, Kik, or LINE for iPad? With the recent release of Hangouts 2.0 I’ve been thinking about messaging services, and how convenient it is to have conversations syncing seamlessly across platforms. You start chatting on your Mac before you leave work, continue it on your iPhone as you head home, and then idly chat as you browse on your iPad in the evening. Hangouts isn’t the only service to offer that kind of experience of course. iMessage and Facebook also offer something similar. iMessage promises that a fluid experience in theory, but the reality that it offers is one of inconsistent notifications, late message delivery, and duplicate chats with the same contact. I like iMessage well enough, but it is definitely inconsistent when it comes to syncing messages across multiple devices. Some messages are sent only to the iPad then appear hours later on the iPhone … and certain message simply never reach the Mac app, even after a restart. Facebook is far more consistent in my experience, but it simply isn’t used for chatting by my friends and family. They use Facebook to post events or exhibit photos, but they don’t tend to sit and talk there. Instead, I’m more likely to find friends on (the newly acquired) WhatsApp, Kik, or LINE (which is huge in Japan, and capitalizes on insanely cute stickers). The unfortunate thing about these apps, however, is that they just aren’t on the iPad. Each of the app websites states explicitly states that iPads (or “iOS tablets”) are not supported by the service. I should state that the Kik and LINE iPhone apps can work on the iPad, but they aren’t universal apps, and LINE logs you out of your iPhone if you try to use the service on your iPad. It’s a sub-par experience all around. It could be argued that the chatting services somehow revolve around phone numbers, and so a smartphone might be required for their use. 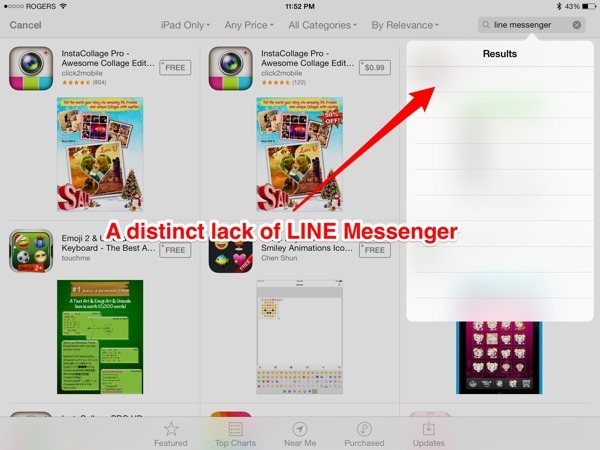 However, LINE Messenger is available on OS X and Windows 7 + 8, with native clients on each of those desktop platforms. If it’s viable enough for companies to put time into making desktop apps, I’m honestly very surprised that we aren’t seeing more of these popular messaging services on the iPad. Even a simple blown-up version of WhatsApp or LINE on the iPad would be more useful than having nothing at all. I can’t be the only one here who wants to message more on the iPad, can I? Or is chatting really an activity that most people feel is best left for smartphones, even in the presence of a tablet?